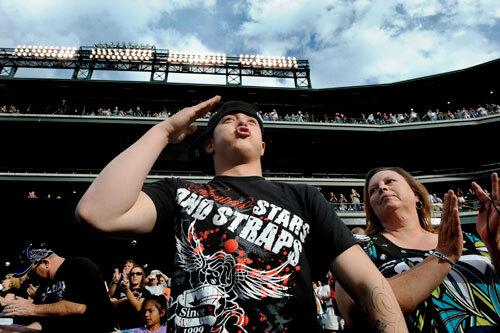 At the end of the national anthem, Ian offers an animated salute while attending a Colorado Rockies game, with his mother, Teri Mercill. As Ian's deployment approached Teri wrestled with every mother's concerns - the well-being of a son heading into harm's way. But on one level, she also saw how Ian had struggled to shake free of a teen culture in which many of his friends floated, directionless, in a kind of limbo. She saw him as accepting of the Army's discipline, yet wistful about the freedoms of civilian life.